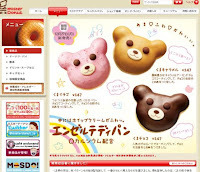 HarapekoDoggyBag Bloggy: Bear Faced Donuts! 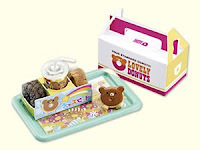 From December 2010, a donut chain in Japan started selling bear face shaped donuts. Wonder if Megahouse got influenced or vice versa. Real Life Version:I had to go through a tray of 10 donuts before finding one of each color in its unblemished and perfect faced form. 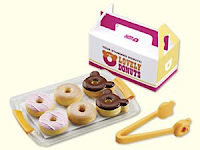 My guess is that they are made in store and by the end of a shift, those bear faces may look a bit wonky. Taste: Definitely winnable with a 4 year old kid. For less than $3, do not expect real cream to be used. I couldn't really differentiate the 3 flavors except for the fact that the strawberry one tasted less sweet than the other 2.